Hong Kong based App developer, Crispapp, launched an application called Facebook Messenger, specifically designed for Apple gadgets. Instead of introducing plain old text-based Facebook chat, users can now try the Facebook Messenger to call buddies around the world, that too without any cost. 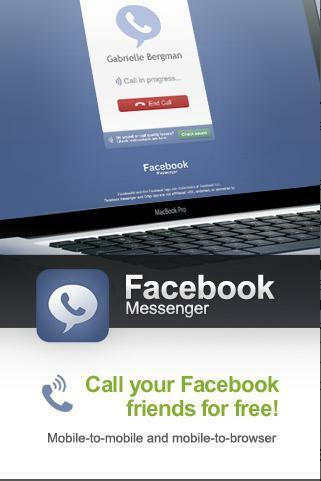 The new Facebook Messenger App lets users call friends and families added on their social networking account using VOIP. For those users who want to stick with the old text-based chat, can do so. Furthermore, the app gives you the feature of messaging history as well as allowing users to share pictures. Logon to your Facebook account through the new Facebook Messenger, you’ll be presented with a list of your online friends. Users can proceed to talk to your friends via text, or if your friend or family is using the Facebook Messenger App on their phone, you can directly connect for a free VoIP chat. If your friend or family is using Facebook Messenger, send them a link which will take them to a website where they can speak via a Flash-based VoIP app. The Facebook Messenger also lets you post pictures, view a friend’s wall, use emotions, browse message history, text chat via Push Notifications and add multi-tasking support from within the app.